Memorial Day signifies the start of Summer to me. It's when we pile in the car for the first road trip of the Summer season, fire up the grill, try to squeeze into that bikini again and tell stories around the camp fire. Oh, the nostalgia of it all. We usually road trip to visit my parents vineyard in California for the weekend. To prepare for the weekend, my sister and I headed up to my parents vacation home and pulled together props that we had around the house for this fun setup. Most of the props came from my favorite antique store in town, and also ones that we had lying around the house for years. What is fun about incorporating your own props into your parties, is that they are great conversation pieces and make the weekend feel much more special. 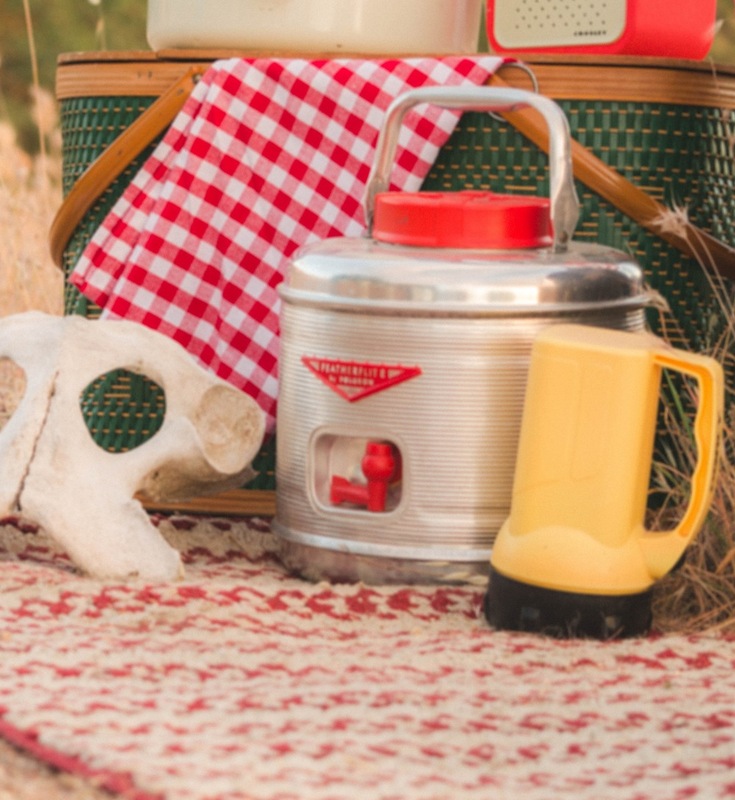 Some of the props included: an old fashioned radio to listen to music, jugs to put beverages in, a picnic basket to transport all of the food items, lanterns and flashlights when the sun goes down, some soft seating, and all of the makings for skillet s'mores! There is one food, amongst many others, that screams Summer to me. Good old fashioned s'mores! The lightly toasted marshmallow that melts the chocolate held together by graham crackers. I love when you bite into the crisp graham cracker and the marshmallow and chocolate oozes out. Does this bring you back to your childhood? Whether you are heading out to the lake house or having a "staycation" to celebrate Memorial day, pull together some fun props you've got around the house and add these skillet s'mores to your menu! These skillet s'mores are so incredibly easy, and they taste exactly like a campfire s'more. What I love most, is that you can make these in the oven (preferred method) or on an open fire at the campsite. I hope you have an amazing Memorial Day weekend! Preheat oven to 450 degrees. In an 8 inch cast iron skillet, arrange the chocolate chips or chocolate pieces in an even layer. Arrange the marshmallows on top and fully cover the surface. Bake in the oven for 6-8 minutes or until the marshmallows have lightly browned. Remove from the oven and let cool for 5 minutes. Serve with graham crackers for dipping. Note: the skillet is very hot when you pull it out of the oven, so it’s important to let it rest before serving! If you are camping: Follow directions above but warm the assembled skillet on a grill over a fire or hot plate until the chocolate has melted and marshmallows begin to melt.